The AutoFold module is used to automatically fix the folding area of a deformer so that no line overlap occurs. The AutoFold module is similar to the Fold module, but since it is automated it is optimized to fit the most standard folding point with less controls to set up. 1. In the Camera view, enable Render mode to preview what the fold will finally look like. 2. In the Network view, navigate to the deformation effect module which is causing the unwanted overlap. 3. In the Module Library, select an AutoFold module and drag it to the Network view. Note that the AutoFold module name changes to AutoFold as it enters the Network view. 4. Connect the AutoFold module directly under the deformation effect module which is causing the unwanted line effect. 5. 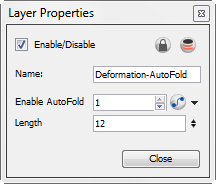 Click on the square yellow button to open the AutoFold Layers Properties dialog box. This is where you can customize the AutoFold settings. ‣ In the Enable AutoFold field, type 1 to enable it or 0 to disable the effect. If you connect this option to a function then you can enable or disable the effect at a specific point in your animation. 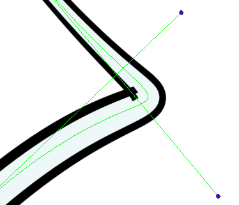 ‣ In the Length field, use the up and down arrows to set the length of the fold axis line or directly type in the desired value. ‣ Click on Close to close AutoFold Layer Properties dialog box.